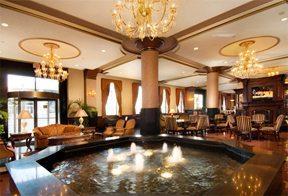 Although the Drury Hotel Plaza consists of three historic buildings listed on the National Register of Historic Places, its the oldest that best epitomizes the history of St. Louis. 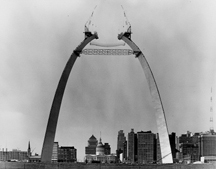 Much like the famed St. Louis Arch is a monument to the country's western expansion, the building was originally built on one of the country's biggest western industries. Constructed in 1919, the building on the northwest corner was the world's most important fur trading auction floor. And for the next two decades, it would dominate the industry as coats and hats became a symbol of prosperity during the roaring 20s — the line between east and west as well as the past and future. After all, St. Louis was not only the gateway to the west, but also a city that thrived with the rise of steamboats and later became the home of the telephone, an invention by the esteemed Alexander Graham Bell. It was an epicenter of progress and expansion, a city unafraid to reinvent itself several times over. The Drury Plaza Hotel brings together several historic sites. Along with the building on the northwest corner, the hotel also consists of the 10-story Thomas Jefferson building annex, which was added to the International Exchange by a hat company in 1957. And the neighboring American Zinc Building, built in 1967, is one of only three truss structural-style buildings left in the United States. Interestingly enough, all three of these buildings were scheduled to be demolished in 1997. According to the hotel's history, Charles and Shirley Drury stopped the wreckers on their way to attend a mass at the Old Cathedral. After purchasing the buildings, they renovated the expansive lobby to reflect the original architecture and opulence of the exchange. Of course, the three buildings aren't the only historic structures that the hotel seems to bind together. The Drury Plaza Hotel is centrally located next to several city assets, including the St. Louis Arch. Hospitality and location make the Drury Plaza Hotel memorable. 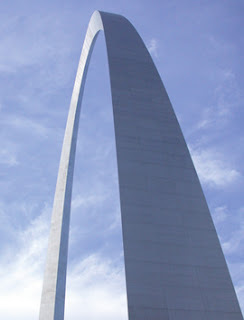 The Arch is the cornerstone of any visit to St. Louis. Built as a monument to Thomas Jefferson and the pioneers who gathered in St. Louis before heading west on the Oregon Trail, the arch also became a symbol of American architecture. The structure is 630 feet (63 stories) tell with an expanse of 630 feet between the outer sides of its legs. Each leg is 54 feet across, constructed with 3/8-inch structural steel on the inside and 1/4-inch stainless steel on the outside. Even more remarkable, however, is to consider that both legs were built at the same time, requiring the structure to be jacked together to fit the last piece. It was built in 1963. Other nearby attractions include the St. Louis city museum, a 600,000-square-foot shoe factory transformed into an eclectic mix of hands-on activities and unique architecture; the Saint Louis Art Museum, which was originally founded in 1878; and the legendary Fox Theater, which opened in 1929. Also nearby is the Old Courthouse, which has its own rich history and exhibits. More than 150 years old, the courthouse is a prominent architectural landmark and site of several historic cases. This is where the first two trials of the pivotal Dred Scott case in 1847 and 1850 and where Virginia Minor's case for a woman's right to vote came to trial in the 1870s. The courthouse was also part of the Underground Railroad. The Drury Plaza Hotel In St. Louis Preserves 5.8 On The Liquid Hip Richter Scale. While the opulence of the hotel doesn't necessarily blend into the rooms, the friendliness of the staff and walking distance to the arch, the Old Courthouse, and Busch Stadium make up for the minor wear and tear. Another nice attribute to note is that the hotel is reasonably priced for being so centrally located. St. Louis isn't always top of mind when people consider travel options, but the city is surprisingly rich in history and has a flair for preserving jazz as it was heard in the 1950s. For details and booking information, start by comparing specials against top travel deals at Expedia.com. While the Drury Plaza Hotel charges for parking, the overnight rate is nominal compared to many hotels.